Palm Beach State College President Ava L. Parker leads Palm Beach County's largest higher education institution with a strategic approach emphasizing innovation, student success, and business and community collaboration. Parker is the first female president in the history of the institution, which opened in 1933 as Florida's first public community college. Growing with the county, the College now offers more than 130 programs of study, including bachelor's and associate degrees, professional certificates and career training. Serving 48,000 students annually, Palm Beach State has earned national distinction as an Aspen Prize Top 150 U.S. Community College. Before joining Palm Beach State in 2015, President Parker was executive vice president and chief operating officer at Florida Polytechnic University, the state's first public university focused on applied research in STEM (science, technology, engineering and mathematics) fields. She also served for more than a decade on the Florida Board of Governors of the State University System where she served as chair and vice chair, and she served on the University of Central Florida's Board of Trustees. Parker was a partner in the Jacksonville law firm of Lawrence & Parker, general counsel at Edward Waters College, general counsel for the 11th Episcopal District of the AME Church and assistant general counsel for the state Department of Transportation. She is on the board of directors of Orchid Island Capital, a publicly-traded specialty finance company. 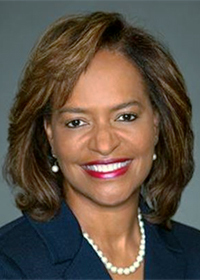 She is a former president of the Perkins Bar Association and the Virgil Hawkins Florida Chapter of the National Bar Association.